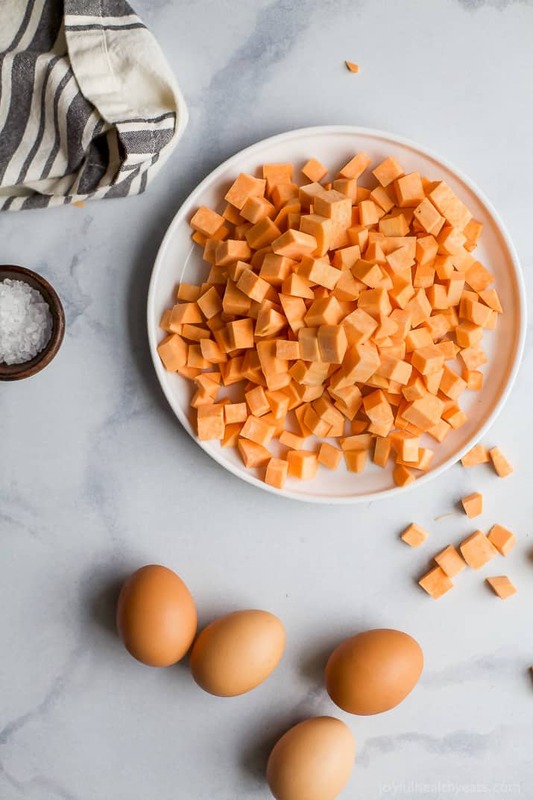 Paleo Sweet Potato Hash & Eggs with bacon – a quick easy recipe you’ll want to devour! 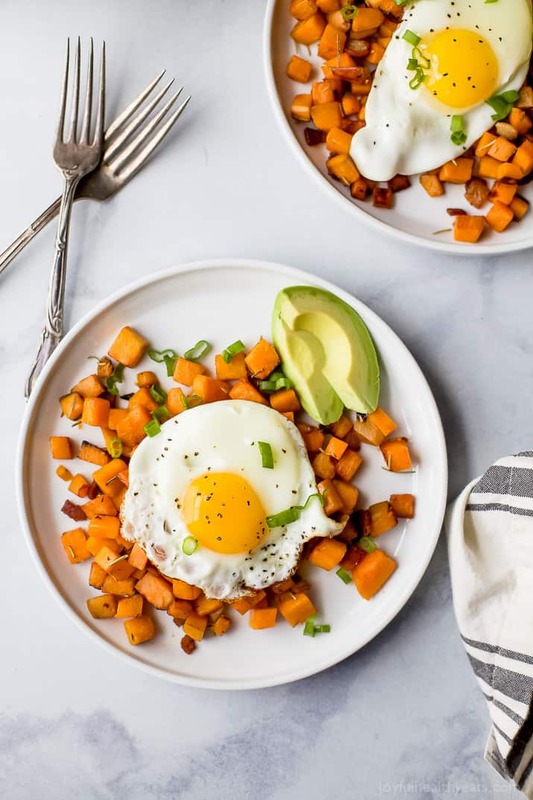 30 Minute Paleo Sweet Potato Hash & Eggs with bacon and avocado. 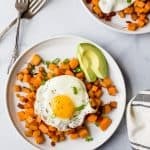 A quick easy breakfast hash that’s under 350 calories and so delicious you’ll want to devour it! Bacon! It makes everything better! Right? And it’s kinda like a requirement for breakfast. Or at least with my boys it is. For me? 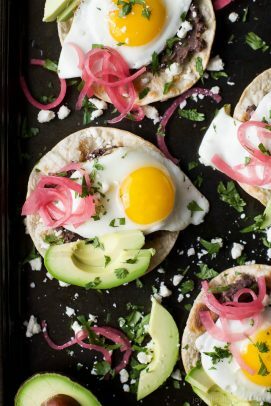 It’s all about the avocado and egg. So I’m combining all the favorites for one dynamite hash. Recently I realized I wasn’t giving myself enough to eat for breakfast. I usually work out in the morning and halfway through my workout I’d feel fatigued and then crazy ridiculously hungry right after I’m done. Like I need a protein shake or something in my stomach STAT! I’m definitely not one of those people who can wait up at 5am and work out on an empty stomach. Even in college when we had three a day practices for volleyball, that first practice I felt like I could barely get my body moving unless I had some “fuel” a.k.a. food in it. That’s what I love about todays recipe. 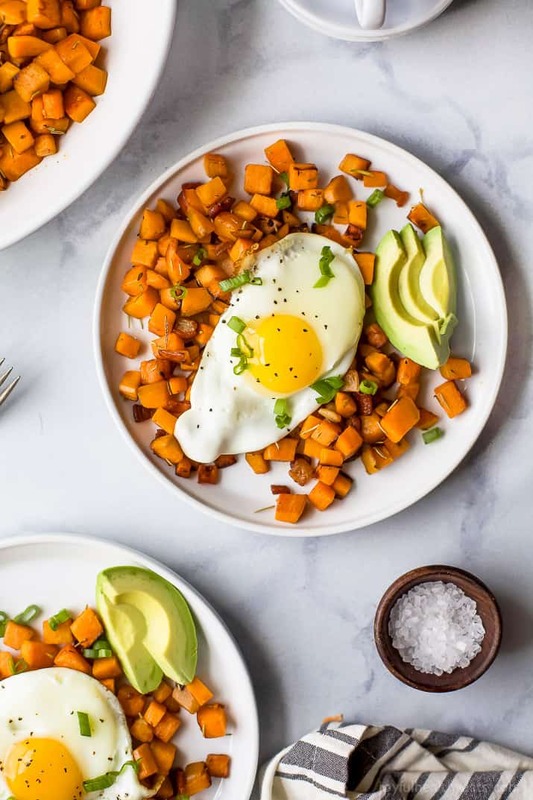 This Paleo Sweet Potato Hash & Eggs hits all the dietary notes you need to fuel your body. Healthy Fats. Protein and Carbs. Yes, your body needs carbs! Not only does it fulfill those needs but it’s freakin delicious! 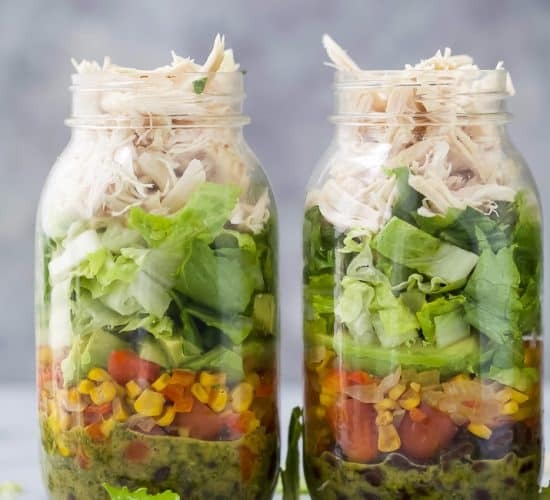 I’ve actually been making a big batch of this on Sunday along with my protein muffins and then I’m set for the week! I even eat it for lunch sometimes with some berries. Which if I’m telling the truth, is probably one of my favorite lunches. Super filling and I scarf it down in like 2 minutes because it’s seriously so good. The Bacon plays so well with the sweet potatoes and then the thyme and rosemary make it warming and delicious. You’ll fall in love. Guaranteed. You’ve got to try it! Ok. I’m off to do loads of laundry from our trip. BEEEyyyyyeee! Bon Appetit friends. And happy Monday. 1 tablespoon grape seed oil. Preheat a large nonstick skillet to medium high heat. Add bacon to the pan. Cook until the bacon is crispy, about 3-5 minutes. Using a slotted spoon or fork, remove bacon from the pan and set aside. Add diced sweet potatoes to the pan (with the bacon grease in it). Toss to coat the sweet potatoes with the bacon grease so they don’t stick to the pan. Season the potatoes with smoked paprika, rosemary, thyme, salt and the minced garlic. 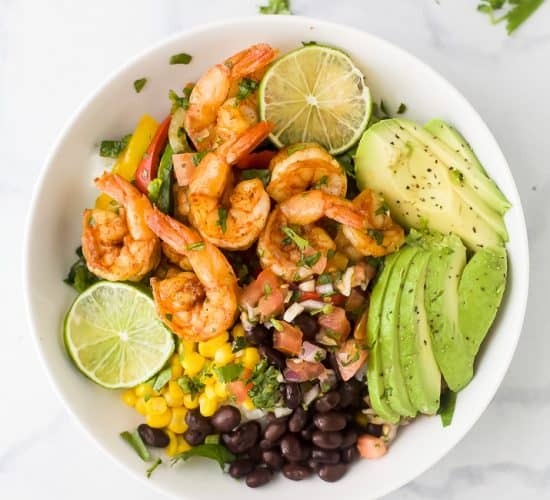 Toss to mix everything together. Continue to saute the sweet potatoes until slightly browned, stirring occasionally. Approximately 10-12 minutes. Heat another skillet to medium high heat. Spray with cooking spray or add 1 tablespoon of grape seed oil. Add eggs to the pan and cook to your desired temperature. 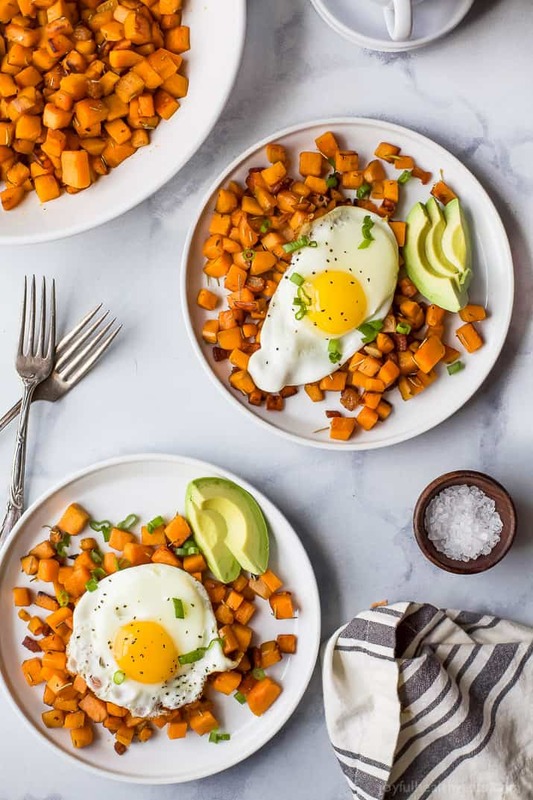 Serve eggs on top of 1 cup of the sweet potato hash. 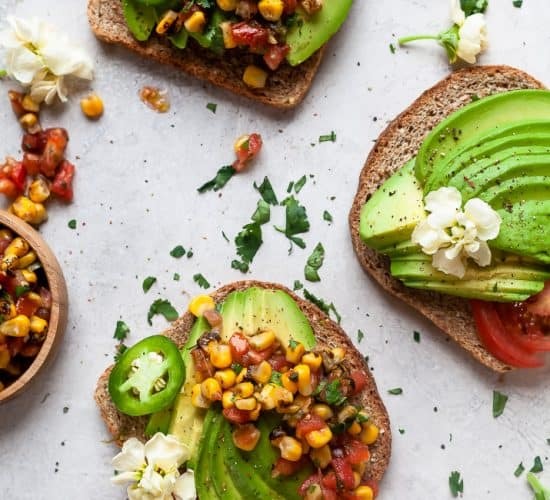 Serve sliced avocado on the side. 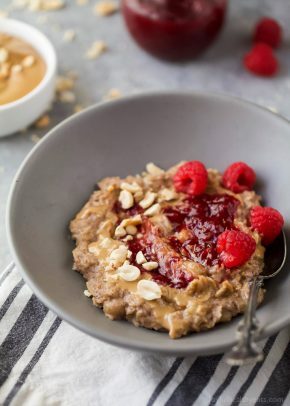 What a wonderful breakfast dish! 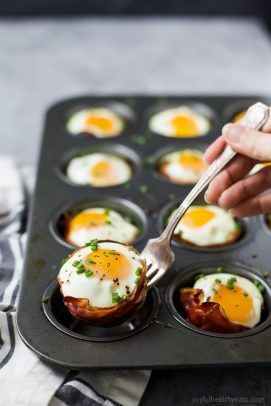 I am going to try this without the bacon – looks SO good! 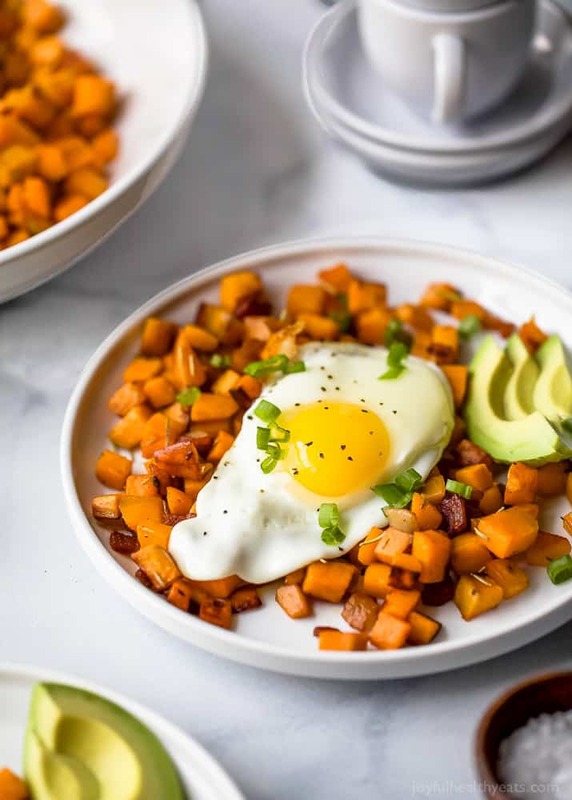 I love sweet potatoes with breakfast! This is my type of breakfast! I will try it on Sunday! 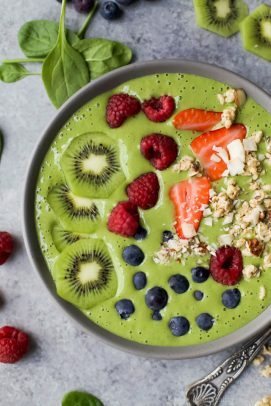 This looks like such a great breakfast idea! Love that egg! I would love to try this! Perfect day starter! !